Dive Journal: Our second dive today is at a site called Hens & Chickens. There is an old wreck at this site, and there is some story about the boat cargo being a bunch of chickens. It is a popular site as there are about 8 other boats in the near vicinity, some snorkeling and some diving. Turns out to be a very nice site. I am leading this dive again, and for some reason I am covering a lot of ground without realizing it. Sarah has given us only a general idea of where the wreck remains are, and I’m basically trying to canvas that area while checking out the many beautiful vistas. There are a lot of things here today, including some huge grey angelfish and some nice rock beauties. An aggressive swarm of midnight parrotfish is especially interesting as they chomp on the algae everywhere (another new fish!). 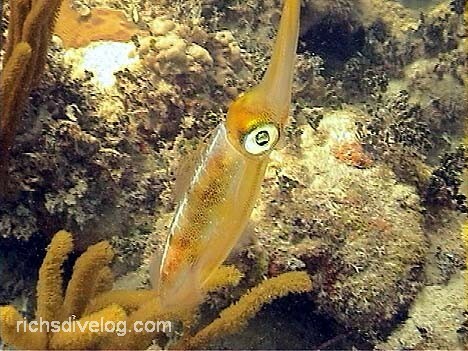 We also encounter two small colorful reef squid, always very cool with their undulating fins. After a while, Jim and I look at each other, and neither of us can see Linda, Janel or John. We wait for a while, then retrace our path for about 5 minutes, but still there is no sign of them. Well, they are only in 20 feet of water – I am a little concerned about what they are doing, but not overly so – maybe they found something great! While we’re retracing, we come across a very nice southern stingray on a sandy flat, who gives us a nice slow winging away. Linda, Janel, and Johnny finally show up, but unfortunately Linda has gotten unnerved at not being able to find Jim or me for a while. We all begin swimming in the general direction back to the boat, and we finally come across the wreck! It is a fairly long boat, maybe 40 to 60 feet, with basically just the skeleton remaining. The main timber that formed the bow protrudes up into the water, and reef life has taken over most features of the structure. I swim along the stem examining a few lobsters and schools of fish in the boat, making my way back to the stern, getting a little video of the wreck. When I turn around, I can’t find Linda – she has already taken off on a course back to dive boat. Well, now who gets left behind?